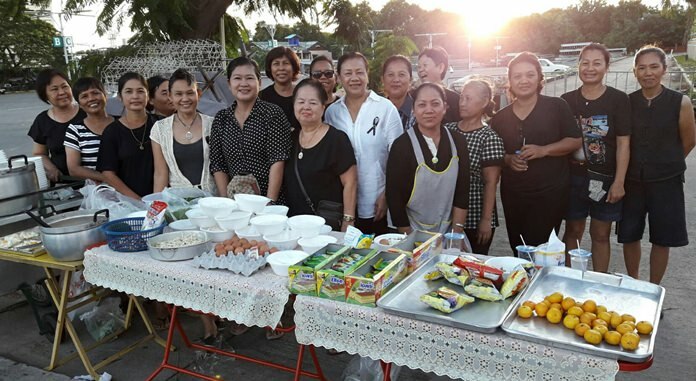 Residents of Pattaya’s Keha Thepprasit Community paid tribute to HM the late King by giving away freshly cooked food for free. Sujin Rattanapreechawit, president of the Aerobics Club of Keha Thepprasit, joined 20 neighbors in collecting funds to purchase the raw materials and vegetables necessary to cook up meals in an effort to “Do good for Dad”. The club, which suspended its dancercise activities during the first 30 days of the year-long royal mourning period, instead joined to make green curry, rice noodles, stir-fried chicken with basil, and sweets like grilled bananas, tapioca and more. All of the food was given away Nov. 9 as merit-making in the late monarch’s name. 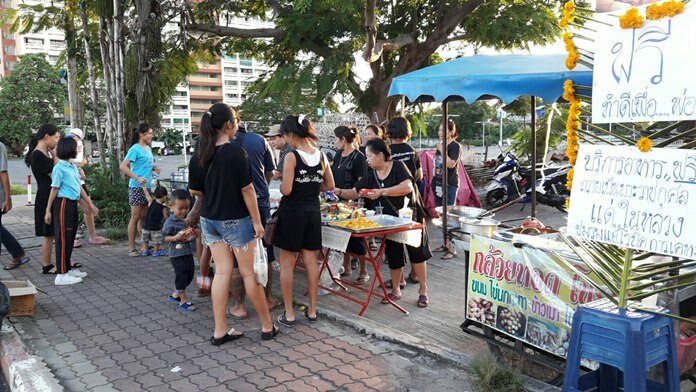 Residents of Pattaya’s Keha Thepprasit Community pay tribute to HM the late King by giving away freshly cooked food for free.